For young children with limited mobility, a single switch attached to a computer with an interface will allow these children to participate in play and learning activities. Below are some websites with activities that can be accessed with a single switch. 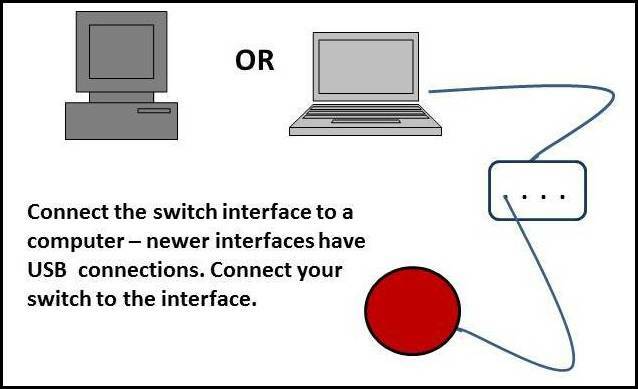 When using a switch and an interface with the following activities, read the instructions on the interface to make sure that it is set so that the switch imitates the function of the space bar. Push the switch to see actions or pictures at Sesame Street.org's KEYBOARD-O-RAMA, Sounds Around Town, Wheels on the Bus, Twinkle, Twinkle Little Star, Big Bird's Shapes, Big Bird's Letters, Big Bird's Numbers, and Peek-A-Boo. Check back often as they are always adding new games. Tap and Color, The ABC Zoo, and the Laugh and Learn Animal Fun Game are my favorites at Fisher-Price's Online Games. Note that only the Infant Games work with single switch access. Kneebouncers.com, once a free site, now sells subscriptions, but still offers a few free fun activities on their site. Go to Hiyah.net for numerous nursery rhymes, songs, and slide shows about a variety of themes. You can download these or play on-line. These are made with PowerPoint and are quite large so you may want to play on-line when possible. At Owlie Boo, press a switch to activate seven appealing games featuring animals. The Priory Woods site has a lot of switch activities; however, only some of them are appropriate for very young learners. Back to School . . .
How Large are Your Apps?